Fun 20s gangster inspired costume for women has a pinstriped suspender catsuit. The black and white catsuit has flared legs and deep V top with button front and short sleeves. Comes with the neck tie choker and money leg garter. Item Number: LA-c85560 | Approximate Size (Inches): 10.00 wide x 3.00 deep x 14.00 high | Approximate Shipping Weight: 2.00 lbs. Black and white saddle shoe has awesome 5 3/4 inch stiletto heel and concealed 1 inch p..
Black and brown vinyl guns are attached to the double shoulder holster and are non-removab..
Black and white pinstripe fedora has a brim and classic shape. 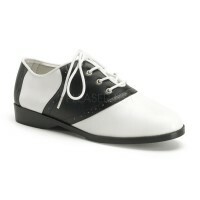 One size fits most adult..
Fun Black and white saddle style oxford has a lace up front, perforated details, and low h..